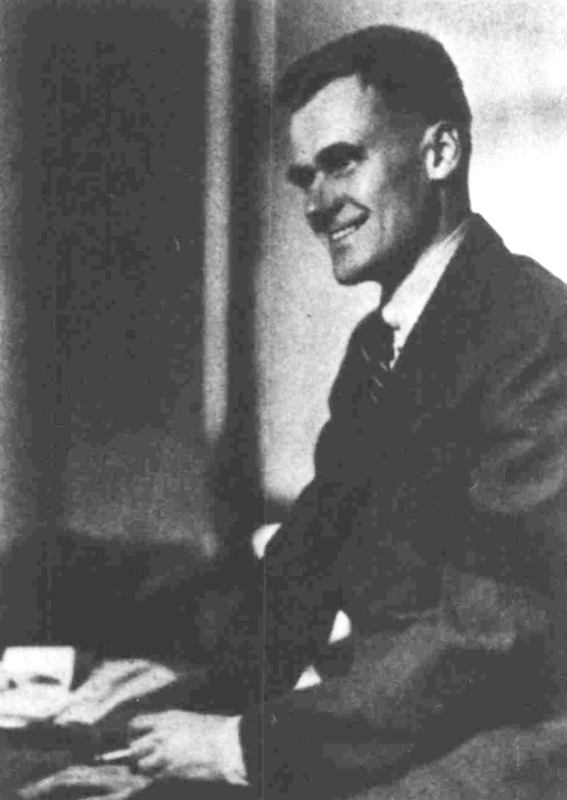 Richard S. Childs, an economist by training, founded Modern Age Books in 1937. Literary Guild founder Samuel Craig was Modern Age Books general manager and the managing editor was a former Macmillan employee, Louis Birk. The firm was established at 155 East 54th St., moved to 432 4th Ave. in 1938, and to 245 5th Ave. in 1941. 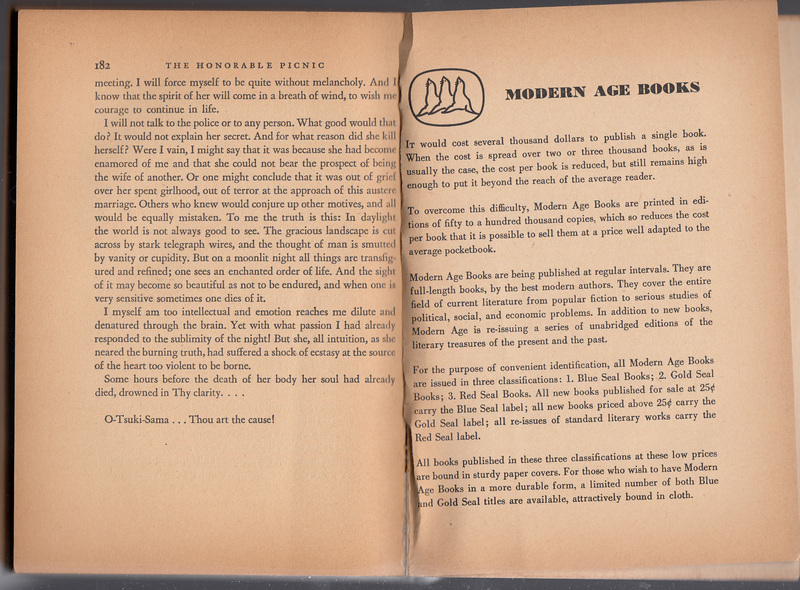 Modern Age Books followed the model set by Penguin in the UK. 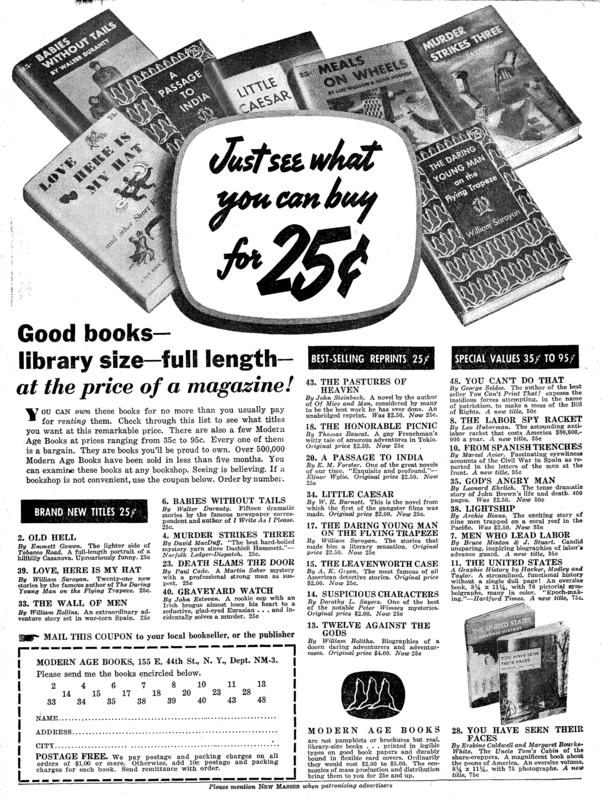 Modern Age Books’ strategy included an emphasis on inexpensive books with high-quality content and eye-catching book design sold through dime stores, drugstores, newsstands, and bookstores. Large printings (50,000 copies) were planned and, to save money, the books were printed by night crews at the Rumford Press in Concord, NH (Childs was from Norfolk, NH) (source). Initially, the books were placed into one of three series, sorted by price-point: Blue Seal Books, Gold Seal Books, and Red Seal Books. The Blue and Gold Seal Books were new titles, the Red Seal Books reprints. The Blue and Gold Seal Books were available in paperback and hardcover, the Red Seal Books only in paperback. A “book service” (book club) was added in 1938 (see advertisement below). By 1938 titles were appearing with the name “A Seal Book” or “Seal Books” as the initial three series approach was discontinued. 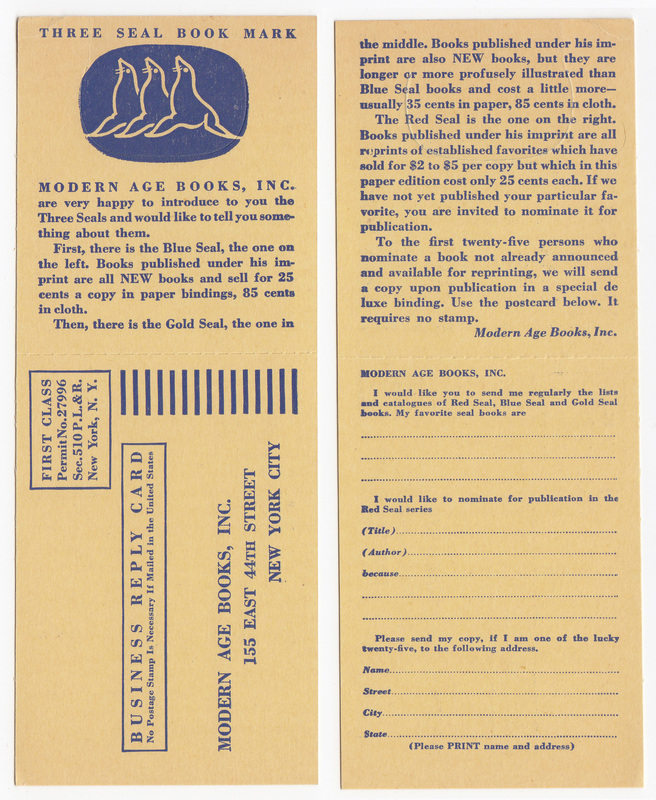 The bookmark below was tucked in the copy of Paul Cade’s Death Slams the Door (1937) (see Blue Seal Books series entry). The bookmark, in a slightly cheeky manner, introduces the three “seals” or series – Blue Seal (new books, .25 cents paper / .85 cents cloth), Gold Seal (new books, larger or with illustrations (.35 cents paper / .85 cents cloth), and Red Seal (reprints, .25 cents paper). The bookmark requests nominations for books to be included in the series. A tiny post-paid card can be detached from the bookmark and sent, requesting new lists and catalogs of Modern Age Books as well as nominations. The three seal publisher colophon is die cut and can be popped out of the bookmark. 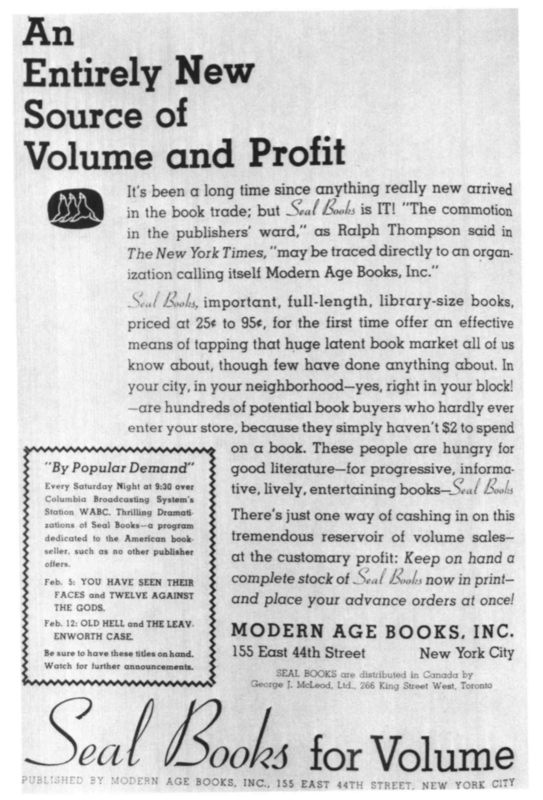 Modern Age Books was central to a discussion about the cost of books and problems of low-cost book publication and distribution in the US in the late 1930s. A centerpiece of this discussion was an article from The New Masses (November 2, 1937, p. 18-26) entitled “The Fight for Popular-Priced Books.” “New Masses makes an author, publisher, reader survey in cheaply priced new and reprint books. 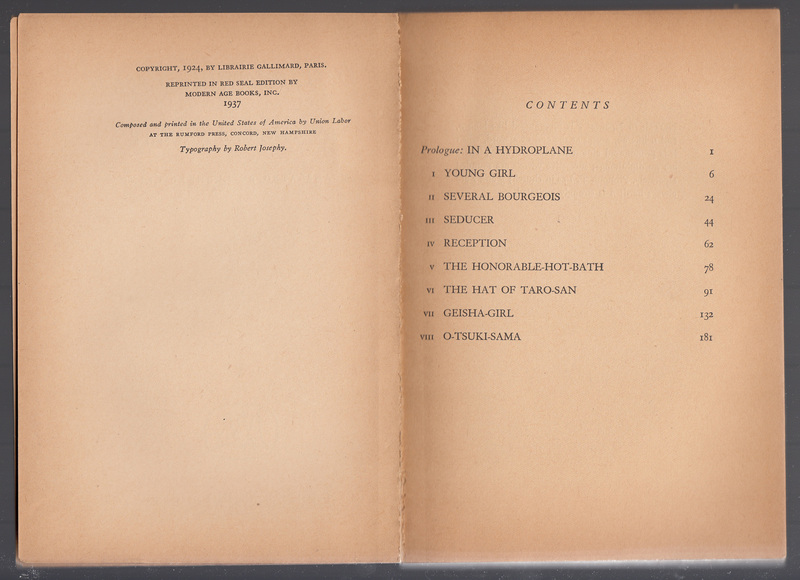 Their cost and distribution problems.” The same issue has two full-page advertisements for Modern Age Books (shown below). Top left and right: The New Masses, November 2, 1937. 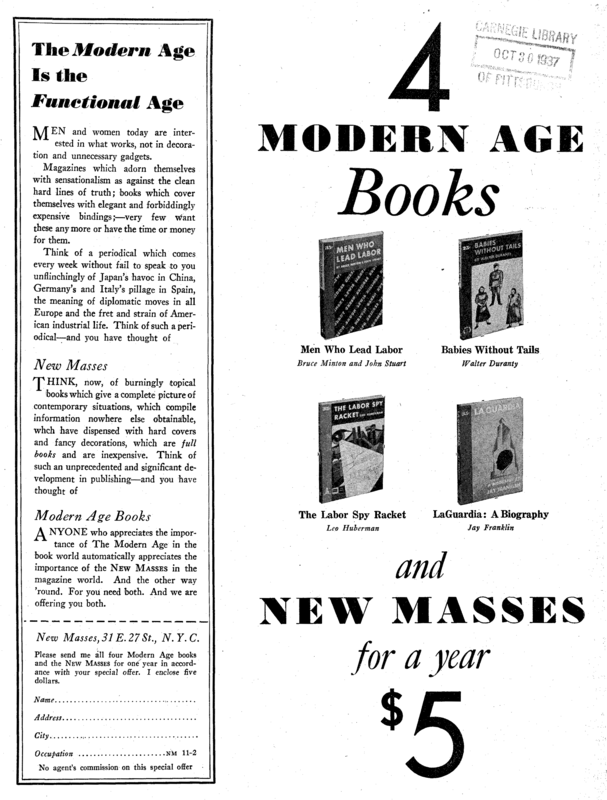 The advertisement on the left is a deal for four Modern Age books and a subscription to The New Masses. Bottom left: The New Masses, April 12, 1938: this is the debut of the Modern Age Book Service (book club). Bottom right: The New Masses, May 10, 1938. 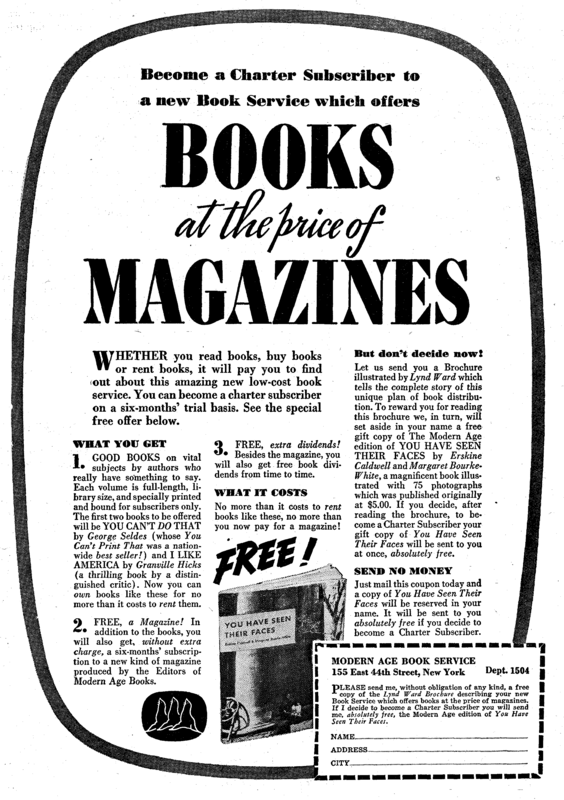 A 1938 advertisement from an unknown source, but probably Publishers Weekly (or a similar publication aimed at retailers) explains the publisher’s approach to retailers and sellers of books. 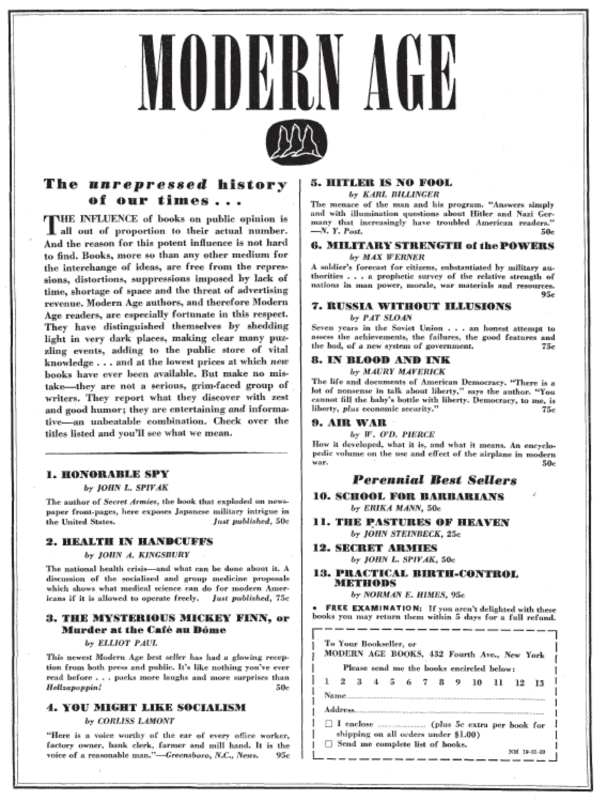 The advertisement indicates that Modern Age Books sponsored a radio show, featuring some of its publications. The Red Seal Books were modeled after other quality paperback series, such as Penguin, in the literary quality of the titles and uniform, modern design of the books. The Blue and Gold Seal books had unique jackets and more varied content. The books have a series number as part of the Red Seal Books, and another serial number as part of Modern Age Books. These 10 titles seem to be all that were published under the Red Seal Books moniker. All carry 1937 dates, and each was issued in copious numbers (at least 50,000). By 1938 fiction titles (still paperbound and jacketed) are issued under the name “A Seal Book” with a redesigned, common jacket that is more geometrical, like Penguin books. 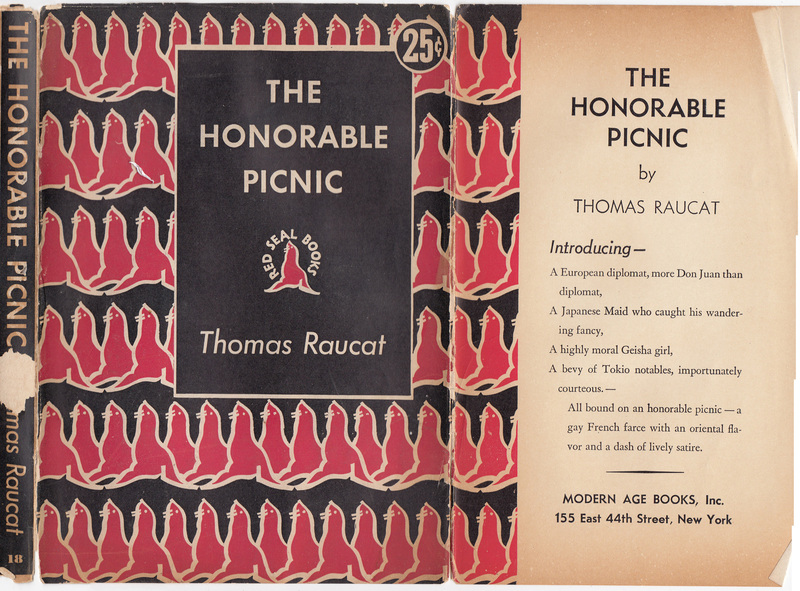 The Honorable Picnic by Thomas Raucat was #7 of the Red Seal Books and #18 of the Modern Age Books. 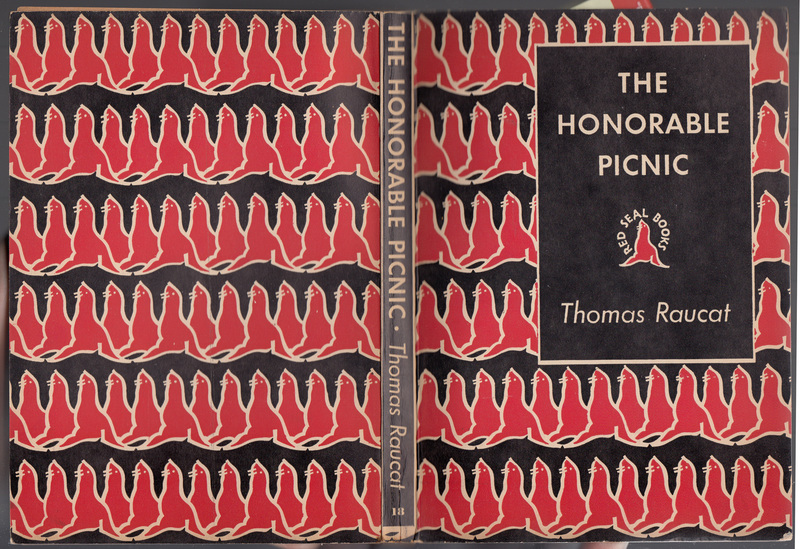 It was initially published in 1924 and issued by Modern Age Books in 1937. 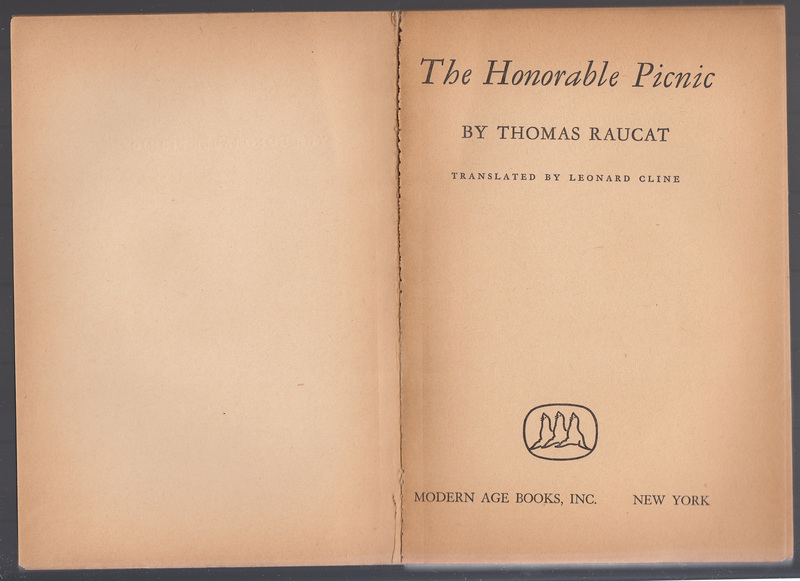 Raucat was a pseudonym of Roger Poidatz, a French WW1 pilot who ended up in Japan after the war training pilots. 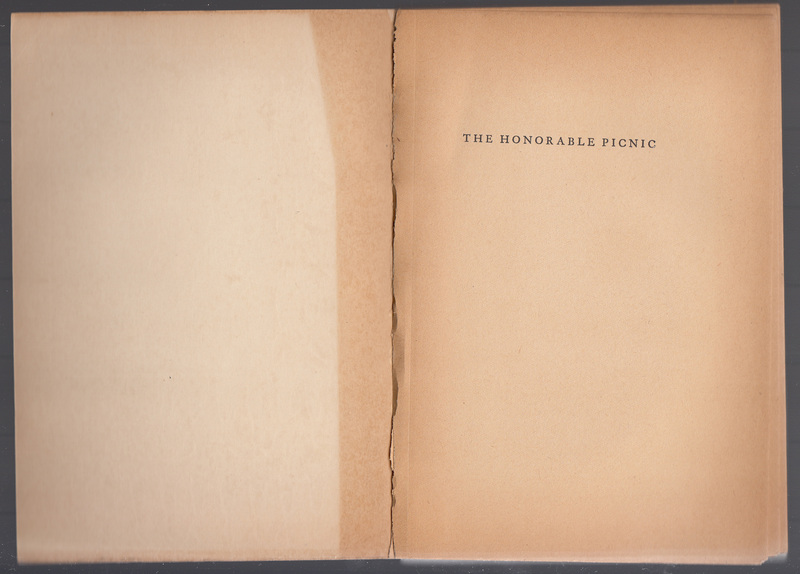 The Honorable Picnic consists of a travelogue of his experiences in Japan. The distinctive jackets for the Red Seal Books consist of red pinnipeds on a contrasting black background, a play on the word “seal.” The title and author are included on the jacket spine, along with the Modern Age Books series number (#18 here) but not the Red Seal Books serial number. The series name is included on the front of the jacket, as is a price (.25 cents). The front jacket flap blurbs the book and its author and includes the publisher information. 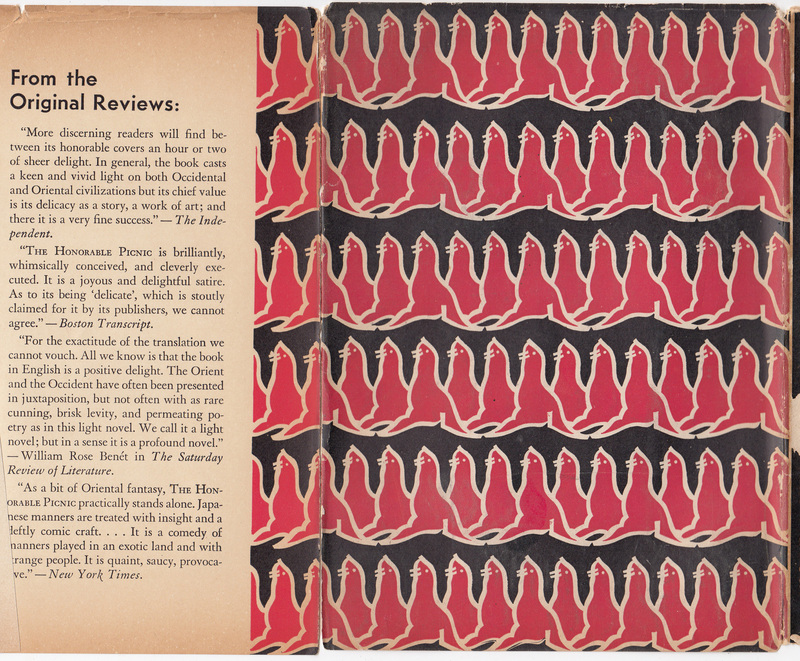 The rear jacket flap includes quotes from original reviews of the book. The red seal design continues on the back of the jacket. The card binding of the book itself repeats the design on the jacket, except that the price is not included on the book cover. The half-title page directly follows the front cover of the book. The title page and the “three seals” publisher’s colophon (the three seals being Gold, Blue and Red Seal books). A prospectus for the series is at the end of the book (the text is reproduced above). 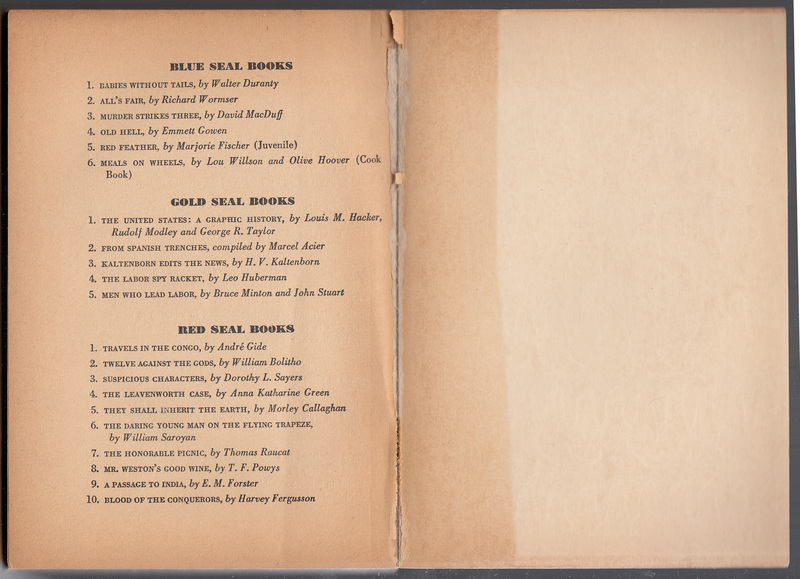 The prospectus is followed by a list of the six Blue seal Books, five Gold Seal Books, and ten Red Seal Books. 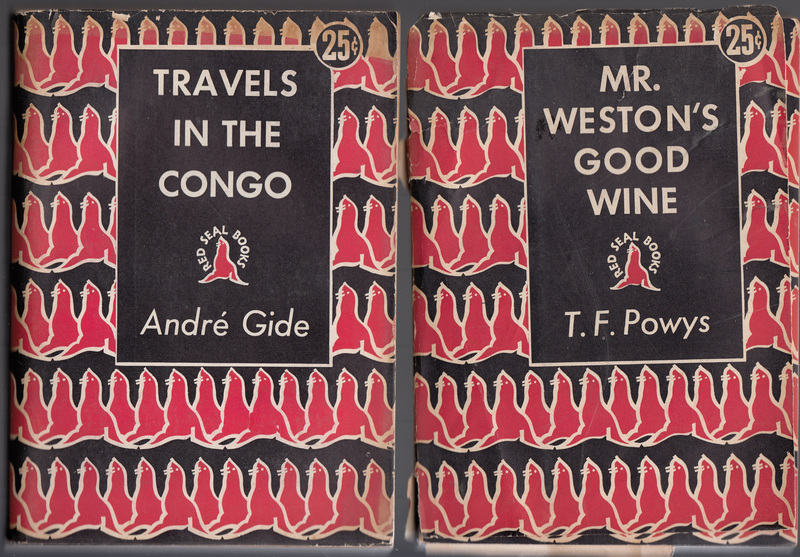 Two more titles in the series (these are the front of the dust jackets) include Andre Gide’s Travels in the Congo (#1, Modern Age Books #12) and T.F. Powys Mr. Weston’s Good Wine (#8, Modern Age Books #19).